This month marks the fourth anniversary of Brego.net. My dad, who has Alzheimer’s, moved in with me in mid-2006, so updates to Brego.net have been sparse lately. 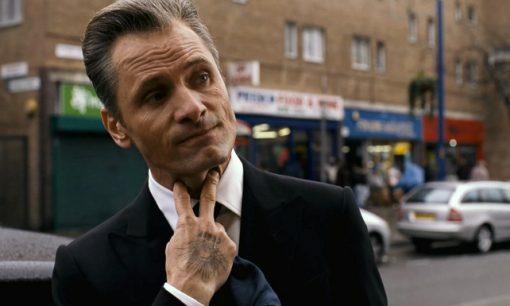 We’ve posted 43 captures of Viggo Mortensen in Eastern Promises to our new Eastern Promises page. See the new A History of Violence poster in our A History of Violence gallery. The Crew is not one of Viggo Mortensen’s finer films, but it’s certainly memorable. Thanks to wwowie at LiveJournal for tipping us off to an official page posted by the producer, Cineville, with a large poster and some scanned news articles. Details on our The Crew page. Found some great new high-resolution (1400×933) stills at outnow.ch, and added them to our A History of Violence page. We’ve continued to add to our A History of Violence page over the past two post-Cannes weeks, including quite a few articles, quotes and images. Added links to articles, photos and video clips (trailers and press conferences) to the A History of Violence page, more to come soon. Had a productive weekend: posted 26 screen captures of Viggo Mortensen in The Prophecy and planted my vegetable garden. Just checking error logs and discovered that the links were broken in the Christopher Walken Prophecy video clips. They’re fixed now – please do contact me if you see anything broken on the site. Video clips, video clips, video clips! Over the past few weeks, we’ve added video clips of Viggo Mortensen in Albino Alligator, Prison, Young Americans, and most recently The Prophecy, plus screen captures for Prison and Young Americans. After I added the new Viggo Mortensen video clips page last Friday night, our server traffic almost tripled overnight. We’ve finally acknowledged the need to ask for help in covering expenses. As you may know, viggo-online.net closed its doors the end of February. We were terribly saddened by the loss of this site and have been trying to salvage some of their articles. We’ve added a Viggo Mortensen Audio/Video Clips page to make it easier for you to find all the clips that are scattered around the site.